The 2013 Baja and Maui whale watching adventures were one of the best years we have yet had watching the Pacific gray whales of Baja and the humpbacks of Maui. The two tours ran back to back with one week based in Loreto, Baja California Sur followed by a second week at San Ignacio Lagoon on Baja with the amazing Mayorals. Pachico Mayoral was one of the first to start whale watching at San Ignacio Lagoon back in the 1960’s. Our third week was spent on the island of Maui looking at the incredible humpback whales of the Moloka’i channel. Early February saw us leaving Los Angeles on Alaskan Airlines for Loreto on Baja California Sur where we spent a week. Day tours included trips across the mountains to Puerto Adolfo Lopez Mateos and the birthing lagoons of the Pacific gray whales. Some spectacular encounters were had with mother calf pairs. We saw the full range of behaviours of the Pacific gray whale from breaching to tail lobbing. One of the benefits of staying in Loreto is that we have access to the Loreto Marine Park and it’s stunning array of islands. We always organise a trip to Coronado Island to see the California Sealion colony and the pelican rookery. For the dedicated birders in the group the blue footed boobies, magnificent frigate birds., turkey vultures, Ospreys and other raptors are a delight. On the tours to Coronado Island bottlenose dolphins are usually encountered in groups up to 30 strong. While in Loreto we never miss the opportunity to head up into the mountains of the Sierra de la Giganta and the high desert visiting the the old mission of San Javier. One of the many highlights of 2013 was going out looking for the mighty blue whales that frequent the deep water between the islands of Danzante, Carmen and Montserat in the Loreto Marine Reserve. This year we had a stunning encounter with a mother and calf blue whale…the largest animal to have ever lived on the planet. Following the week in Loreto we headed up to the famous San Ignacio Lagoon for some more Pacific gray whale viewing. Our host, Jesus Mayoral is one of the most experienced Pacific gray whale watch operators in the world. Here we saw the male “heat runs” where several males compete for the attention of receptive females. The antics and commotion have to be seen to be believed with barging and head and tail slapping and numerous breaches and tail lobs. Following San Ignacio I returned to Los Angeles prior to heading out to Maui with a group for the humpbacks. Staying in the small community of Lahaina we were able to take daily tours out to a number of different areas. 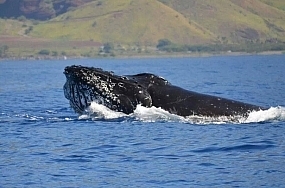 The full repertoire of humpback behaviour can be seen in the channels between the islands of Maui and Moloka’i. From passive mother calf interactions to breaching and the full on”heat runs” dominated by competing males with head slamming, tail slapping and barging so characteristic of this charismatic species.